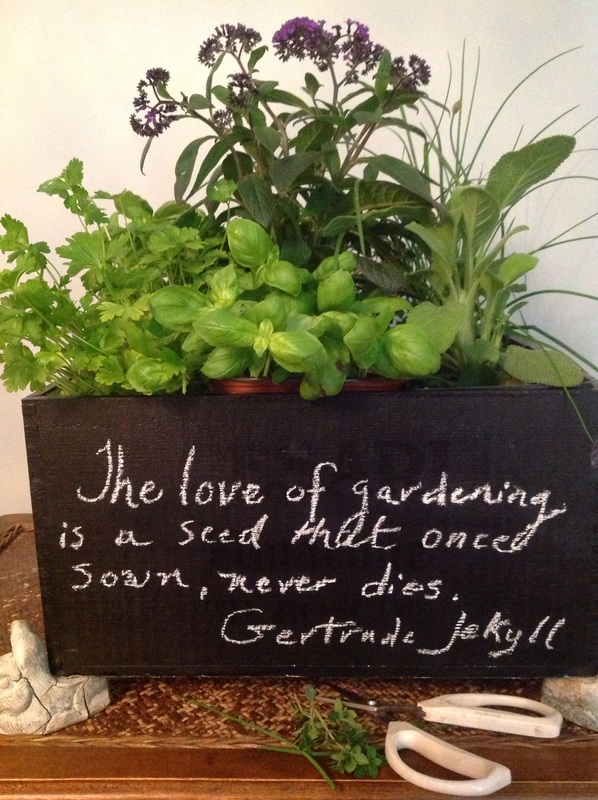 Wine crates are one of my favorite containers for displaying flowers. They are available for free from most wine stores and come in many different sizes. They can be painted or stained if desired to coordinate with a décor theme. Because of their generous size, they make an imposing centerpiece once filled with flowers. This wine crate was filled with pots of annual flowers. 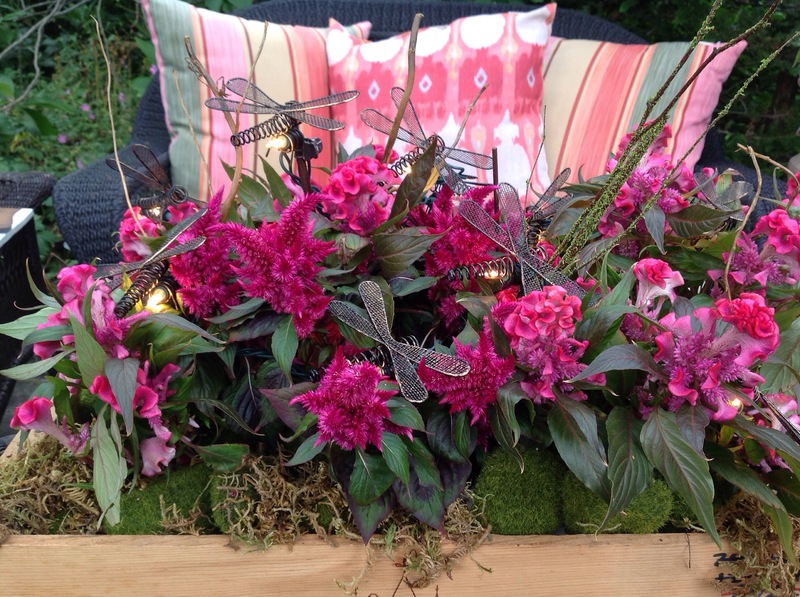 I ran a string of whimsical dragonfly lights through the flowers to light up the centerpiece for an evening party. Magical! For detailed instructions on how-to, please click here. This pavé-style centerpiece for a wine and cheese party was filled with 2 dozen marbled roses flanked by wine bottle candle holders. Very chic and stunning yet easy to do. You could take it another step and choose a crate of wines from the same country as the cheeses you are featuring. Detailed instructions here. 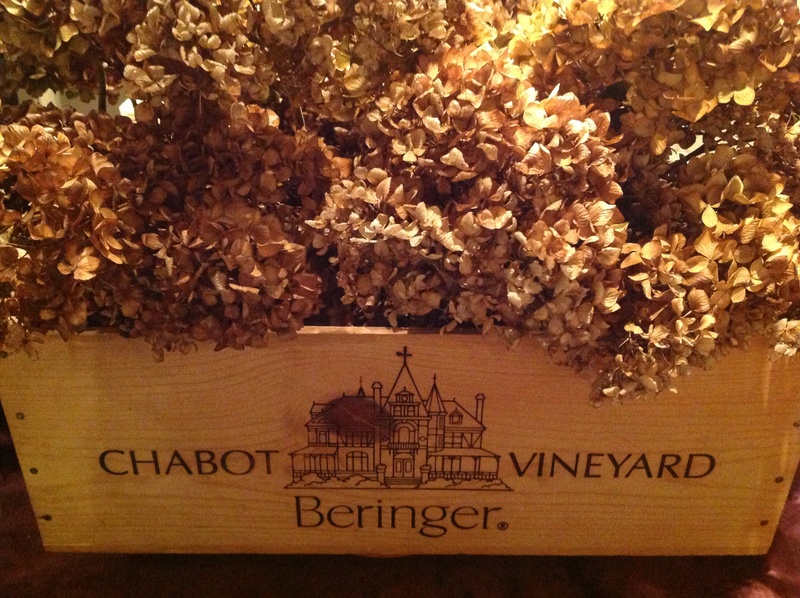 Filling a wine crate with dried hydrangeas is an easy way to get a dramatic centerpiece in a few minutes, no water required. Details here. 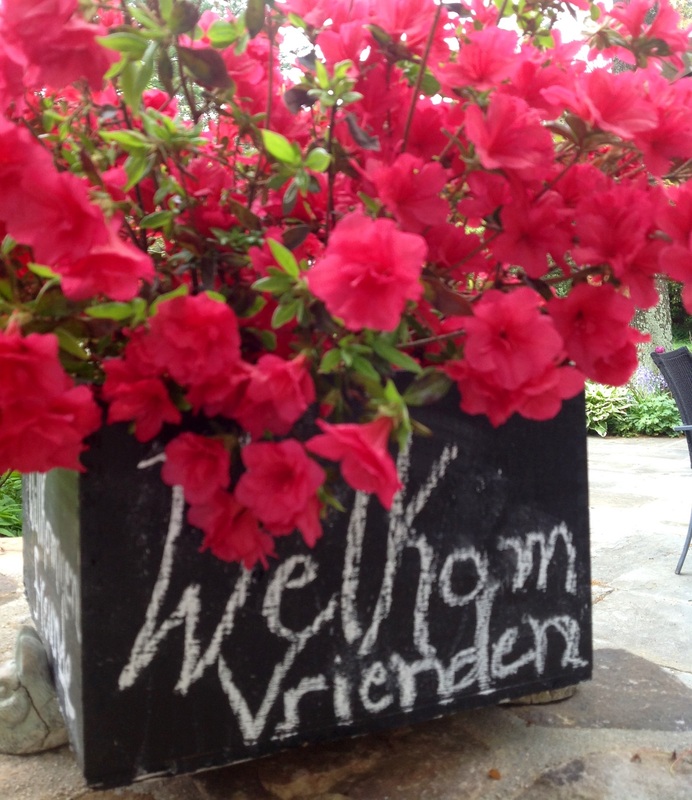 Painting a wine crate in chalkboard paint allows one to write messages on the sides as I did for this blazing azalea display. This is a creative and versatile option for weddings, showers, graduations and birthday celebrations. Details here. 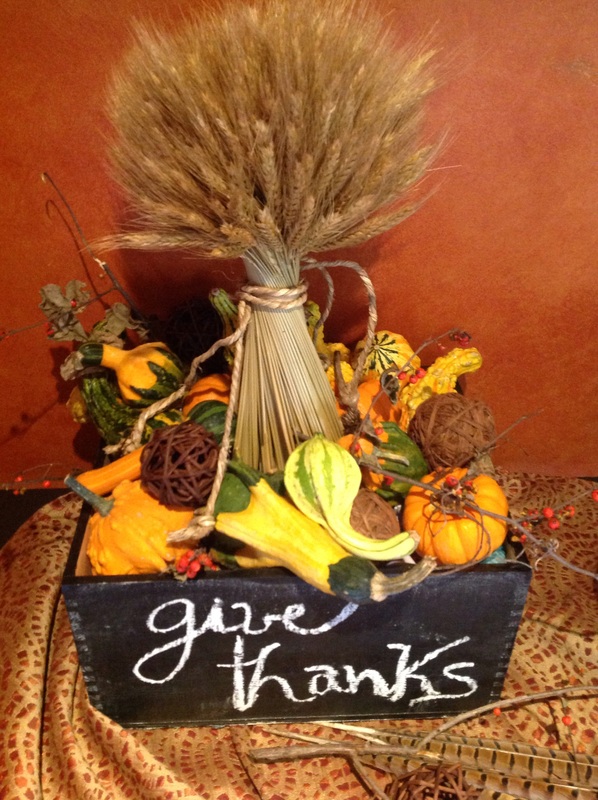 The same chalkboard painted wine crate is repurposed for Thanksgiving and filled with an exuberant display of gourds surrounding a wheat shaft with an inscribed seasonal message. Instructions here. Another seasonal idea would be to fill the crate with potted amaryllis surrounded by greens and pine cones. 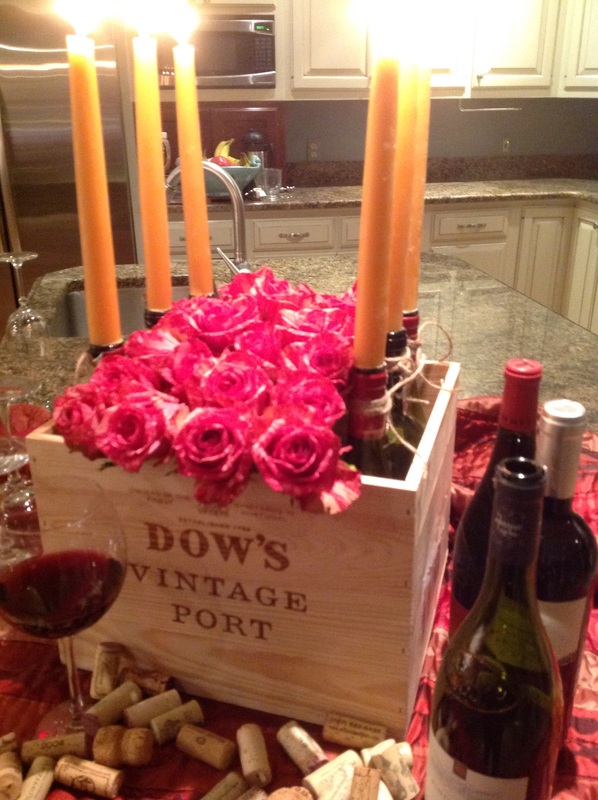 I hope you have been inspired to create your own centerpieces with wine crates! This entry was posted in Entertaining, Gardening, Tablescapes and tagged creative uses of wine crates, light up flower centerpiece, recycled wine crates, wine crate in flower arranging, wine crates for centerpieces by Johanne Lamarche. Bookmark the permalink. These are awesome Johanne! I need to get me some wine crates! Full or empty ones, Julie? You certainly have some great inspired and innovative ideas Johanne- love the ingenious crates with all the embellishments. Yeah YOU! You are so kind Loretta! I had fun creating all those different arrangements with the wine crates. Filling a crate with all the produce you harvested today would make a great centerpiece! Lucky you!! I was admiring a stack of wooden wine crates at the grocery store the other day, but was afraid to ask for one…I’m going back!! 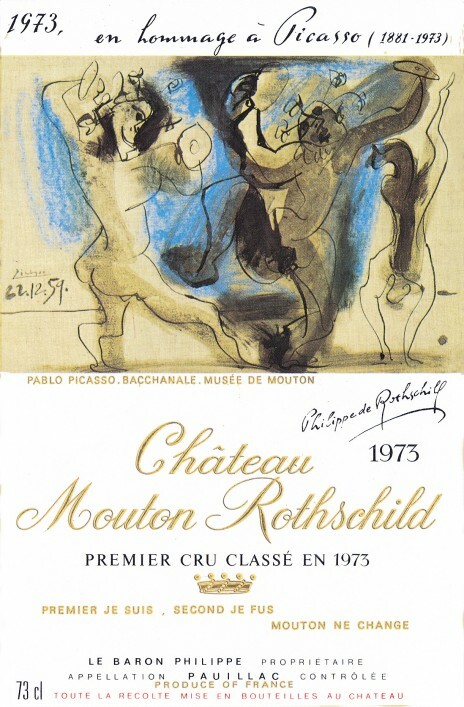 All your creations are great but I was really knocked out by the wine and roses one! Gorgeous! Run right back and get your hands on those crates Jenna! I know you will come up with some awesome ways to use them! Drill a couple of holes on each side and fashion cotton rope handles for a nautical touch for your summer home! The wine bottle-rose one is a favorite of mine too! Thanks Elaine! The possibilitites are endless for creative ways to use them, right? How darling are these!! I’m rather proud of a little wine box I beautifully stained. I keep it on my table and it’s just the right size for the tv remotes! 🙂 Not that anyone else but me puts them in there, lol! Sounds like my house too Mollie! LOL! Not sure if LCBO gives them out Lindy, but sure hope so! They are so much fun to use. The LCBO sells them. Wily outfit that it is! Not surprised!!! Wait until your next trip across the border!! Can I pick them up free at liquor stores in the USA Johanne? Oh and i just read your Tarte au Sucre post. Your mother is a doll! Yes In Pennsylvania at least. Also in supermarkets that sell wine. I usually call and they save them for me. My mom is a doll! Almost 85 and still a force to contend with, fiercely independent! So lucky to have her.